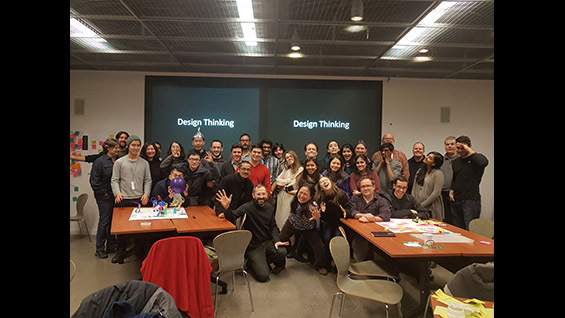 During the last weekend of January, 23 students from the three schools, 4 faculty, and 3 staff members participated in the Design Thinking Boot Camp; a 2-day workshop centered on teaching a methodology for creative problem solving used by many innovative firms, educators and scientists. The workshop was co-organized by Dr. Eric Lima, associate professor of mechanical engineering and Lee Kim, Cooper alumnus (class of 2000, Mechanical Engineering) and adjunct professor (EID103- Principles of Design). 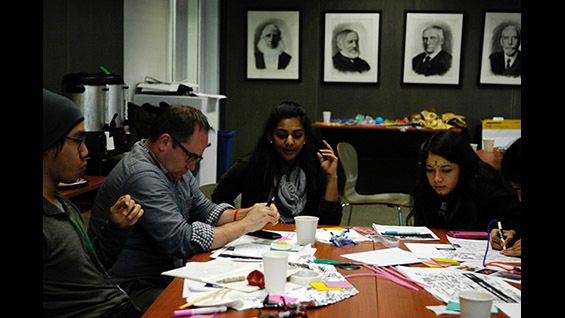 Design thinking is a method of inquiry that came into mainstream discourse during the 1980s and has been applied to a wide range of problems, from how to create meaningful work to how to redesign a classroom to better meet students' needs. 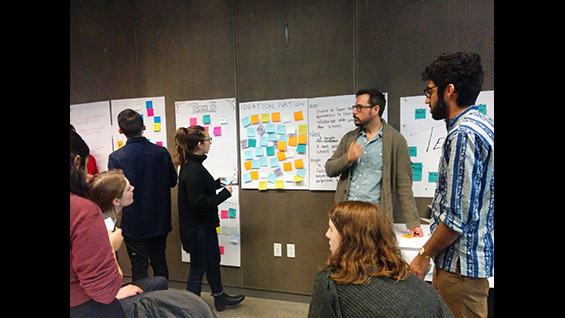 The problem the 30 participants of the workshop were tackling was how to better promote a sense of community between the three schools at The Cooper Union. After analyzing the data from the interviews, they created an archetype student, Gabi, who was experiencing isolation from friends and activities under the weight of school work. Each team generated ideas to relieve Gabi’s isolation and then tested those ideas on students that were not part of the workshop. This was done by rapidly producing props to used in an immersive skit that would demonstrate the gist of the idea as if all the necessary technology and services already existed. Participants in the skit would gauge the reaction of the audience to determine the effectiveness of the idea and to generate ideas for further refinement of their idea. 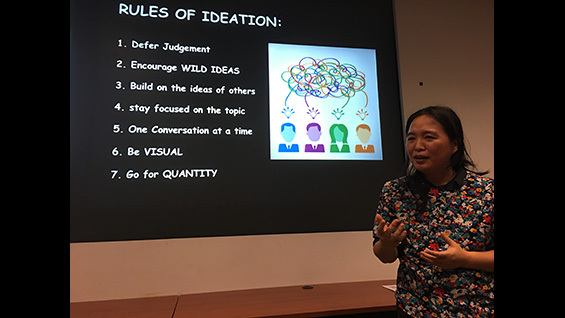 Lee-Sean Huang is co-founder and creative director at Foossa, which works with companies, non-profits, and government agencies to better understand and reach their audience. He was a team leader for a group of engineers and artists during the Cooper boot camp. He explains design thinking as an approach to problem solving that puts people at its center. 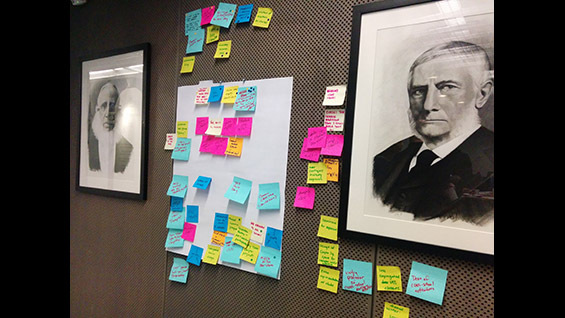 “But design thinking is more than problem solving, it's also about reframing problems to deliver value. There is an old joke: how many design thinkers does it take to change a lightbulb? Punchline: Does it need to be a lightbulb?” Which is to say, design thinking is a method that not only finds answers, but analyzes the very questions being asked. A first-year architecture student, Irisa Llana, applied to the workshop to collaborate with students from the other schools: “I was excited to have the chance to work with students from different majors, do something outside my routine and introduce myself to new opportunities.” A freshman in mechanical engineering, Sophie Schneider attended for the same reason, looking to work with students outside of engineering as well as upperclassmen and faculty. She also was curious about design thinking. “The workshop showed me the value in slowing down and breaking up each part of the design process. It was valuable to be able to work on solving a problem in a very structured way—very different than I usually work,” she said.